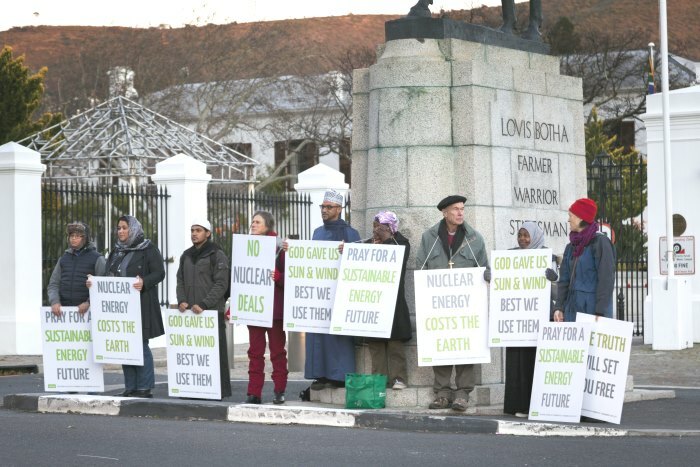 Faith communities, supported by the Right2Know (R2K) Campaign and others gathered outside the Cape Town Parliament to demonstrate against the government’s continued secrecy around the nuke deals. On 1 September, Minister Joemat-Pettersson, Minister of Energy, told members of Parliament that she was committed to a transparent process around the nuclear deals. That same day, SAFCEI (SA Faith Community’s Environmental Initiatiative) received a letter from Treasury referring their request for the financial options model and economic impacts of localisation studies to the Department of Energy. On 11 September, SAFCEI received a letter from the DDG for Nuclear Energy, Mr Mbambo, refusing to release details of the financial options model and economic impacts of localisation studies to the public. Affordable electricity that does not endanger our environment is essential for our wellbeing. Yet, right now a nuclear programme priced at R1 trillion is being promoted by South Africa’s government. Secret deals with foreign governments for about 8 new nuclear stations (9.6GW) are being negotiated by President Zuma and the Dept. of Energy. We cannot compromise our sovereignty or energy security with contracts that commit all South Africans, for generations to come, to some of the most expensive and risky energy technology in the world. 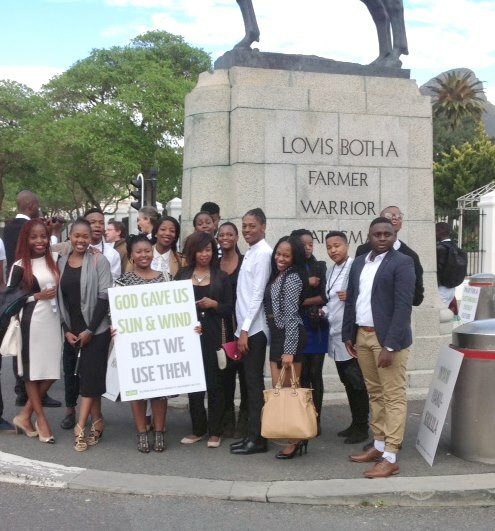 SAFCEI believes that people of faith need to take action to oppose these nuclear deals. Failure to prevent this would mean that South Africa would be locked into a nuclear future with long-term costly impacts on society. Join SAFCEI in calling on cabinet to reject nuclear and to expand the renewable energy programme by joining their weekly #NukeVigil. Join them in calling for accountable decision-making; our energy security and our democracy are at stake. 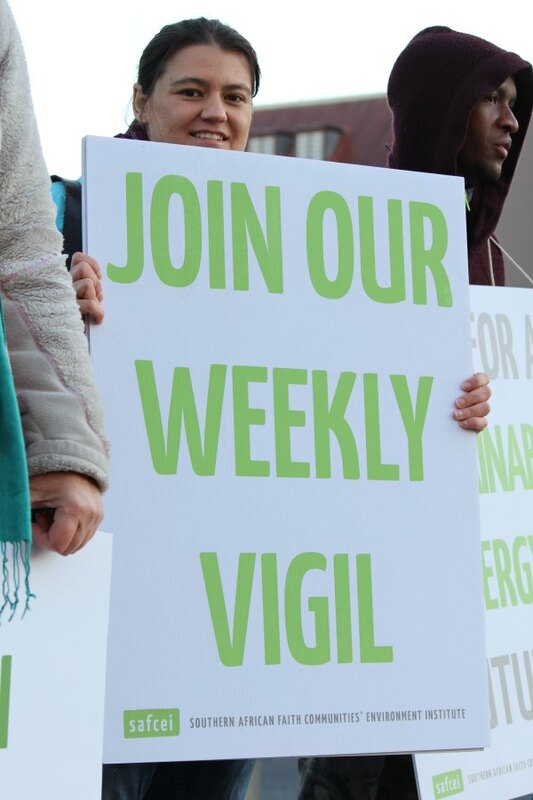 The vigils are held every Wednesday morning from 7:30 – 9:00 outside Parliament in Cape Town and simultaneously outside the Department of Energy offices in Pretoria from 7 – 8am. For more information contact Liz McDaid, SAFCEI energy and climate change programme coordinator Liziwe or Sarah. If you can’t make it to the vigils, write a supporting message on a piece of paper and send them a photo of yourself with your message to add to their Digital #NukeVigil. Post it on Facebook or Twitter using #NukeVigil. SAFCEI, together with Earthlife Africa Johannesburg, is also gearing up to launch a High Court application aimed at ensuring that the procurement of nuclear power plants does not occur in a corrupt or otherwise unlawful fashion. But they need your help! They need to raise 1.5 million to prepare and run a court case to help stop the procurement of nuclear energy for South Africa. They ask for your contributions – the smallest donations are welcome. Every |Rand counts. SAFCEI has instructed its lawyers in this matter, Open Democracy Advice Centre (ODAC), to launch an appeal against DoE’s refusal to provide information on the costs of this massive scale 9600MW nuclear deal. If we commit to a package deal with Russia or any other vendor, without knowing the details of what we are paying for, we will be buying a huge environmental risk, which could cripple the economy, undermine social support for the poor and vulnerable, and expose our ecosystem resources on which we depend, to irreparable environmental harm. The history of nuclear build projects is that they generally involve significant cost overruns and are delayed. This means that Treasury would have to find the extra money to meet the contracted payments, which could come from pensions, social grants and money allocated for housing or education. This is the second refusal SAFCEI has received on this topic. Earlier this year, SAFCEI had asked for the details of the intergovernmental agreements and for copies of “any affordability or feasibility study conducted by the Dept. of Energy with regard to the procurement of nuclear power”, had been refused, and had appealed that refusal. In a letter dated 13 July 2015, the Minister claimed that such information was “commercially sensitive” and would not be released, and also stated that the right to secrecy trumped any public interest. “In other words, it seems that the Minister of Energy and her Departmental officials have decided that they are going to buy costly nuclear reactors, in secret no matter what the cost, and tell us after the fact, if they tell us at all,” said SAFCEI spokesperson, Liz McDaid. Minister Joemat -Pettersson signed the Russian nuclear deal one year ago on 22d September 2014, a scant two days after she received the President’s approval to do so. In December 2014, Treasury admitted that they had not had access to the financial implications of such a deal, nor had they any report or independent analysis of their own. On the 1st September 2015, Treasury responded to a further request from SAFCEI for the financial modelling and economic benefits studies on the nuclear deal, claiming that they did not have them and referring the request to the Department of Energy. “The attitude of automatic secrecy adopted by the government is unacceptable. There is an arrogant assumption that South Africans have no right to such critical information about nuclear projects that impact on our future until it is too late. This raises grave concerns about the government’s commitment to constitutional rights, transparency and public participation,” stated Sean Brown, SAFCEI’s Acting Director.